Bi-polar, borderline, doomed to suffer for the rest of my life… – or not? After having a very difficult and unconventional childhood, turbulence into my adulthood and after having my fourth child, I was sectioned under mental health act. I had previously been told by doctors that I would suffer from depression all my life, but this time they diagnosed me with bi-polar which was a shock, and prescribed very heavy medication which I did not like but kept taking on and off for years. Over the years I had also got very drawn to addictions of all sorts. For a long time when I couldn’t cope, I kept ending up on a mental ward. I was given another diagnosis: “emotionally unstable borderline personality disorder” for which there is no medication. I was very fortunate in having a wonderful friend in Tom and later his lovely wife, who were there for me as I was faced with taking responsibility for my own mental health. Thanks to Toms wisdom and kindness he offered me a session. It ended up being a very powerful session! After just 40 minutes I was no longer able to believe in any mental diagnosis. I was able to see that my mental and emotional extremes were something I had formed because I could not deal with reality. Accepting that they were there to help me cope because I had no other learned mental tools, I was able to accept my own full responsibility for my own mental and emotional well-being and my work on me could begin! Although I have to admit I feel a bit lost without my extremes and miss having the option to lose control, but I am learning new ways to cope. Thank you, Tom, for your persistence and kind caring. I’ve started work with Tom during the most challenging situation in my life. Since it was connected with my daughter, who was in deep crisis at that time, I felt completely overwhelmed and depressed about what was happening. I desperately needed help how to cope with that situation. I have been working for over three months on regular basis and it was deeply transformative time. It appeared that if I want to be helpful to my daughter, I have to solve my own inner conflicts. The process was painful. It was a really intensive piece of work but eventually, it was the most valuable lesson for the future. I’ve removed lots of difficult emotions from my subconscious, I`ve worked with fears that had been blocking me for such a long time. I`ve worked with memories which were unwanted ballast of the past and only limited me. During the work, my life started to change in the most unexpected areas. I’ve discovered strengths in myself that allows to overcome difficulties and learn from it. I’ve gained the courage to take responsibility for my life, I was given lots of information and tools, which I can use independently on my own so I feel more freedom and have more confidence to my own possibilities and resources. Sometimes it`s difficult to make a decision “Yes I`m going to change my life”. I am more than happy that I took the chance and I would recommend it to everybody who wants to change the situations and don`t know how. When I started the process I was in deep crisis, after over three months of working I`m strong enough to push my life on the new track and every day I`m amazed how much I`ve changed. Transforming my beliefs, thoughts and limitations have an unbelievable impact on on my daughter. After struggling for about year with eating disorders (anorexia), finally we came to the point that my daughter is eating sufficiently to gain healthy weight. “. And the best thing is that I`m not afraid of the future any more, on the contrary, I`m curious about it. I had struggled with depression for 10 years. My multifaceted and multi-hued depression was fed even more by bereavement. When I contacted Tom I had not any clear expectations of the treatment, I was confused. During first sessions we painstakingly elicited my goals. That was the most difficult part of the process. It allowed me to draw out and concretise my problems, take a look at them and describe them. I needed that because I usually felt flooded by vague emotions and thoughts. Tom earned my trust by saying that he did not care for making me dependent on him as a therapist. He wanted me to take from the therapeutic process new skills and tools so I could manage independently. Tom put a lot of effort into our work in and outside the sessions. He was well prepared to every meeting and he expected the same from me. He would create certain structure of treatment and shared his ideas with me. Then he was adapting his framework to my way of thinking and perception. He would also take into consideration my needs, should I find some difficulty in our communication. Despite my worries about the effectiveness of Skype meetings, I actually felt really comfortable working via computer – I did not have to go out, I could stay in the familiar and safe surroundings. My work with Tom focused on two main problems related to old unfinished problems stemming from complex family history. It was a very intensive piece of work. Tom led me through the process of clearing negative emotions embedded in those problems. Then he helped me to integrate conflicted parts of my personality. I was shown the tools which I could use by myself to consolidate my achievements. Thanks to them, six months after the end of the work, I continue doing well instead of being defeated by yet another wave of depression. I regained access to many memories and also to forgotten creative abilities of mine, like imagination. I can enjoy experiencing my emotions without losing an ability to think analytically. I again can feel joy and pleasure. The sadness stopped overwhelming me. It became one of many regular emotions I am capable of experiencing. For the first time in a long time I feel inner peace. I decided to work with Tom because my friend worked with him and she highly praised this cooperation. Struggling with my problems, since I can remember, trying to get to the source of it through reading wise books, conversations with friends, practicing meditation, Tai Chi and meetings with therapists, I thought: “if the guy is half as good as she says, I can not pass up this opportunity” . I was working on two problems with Tom for more than half a year of once a week meetings on Skype, which I thought would be unnatural. Wrongly, as it turned out. Because it’s not about the communicator, but it’s all about communication and content of it. I worked diligently, performing tasks that I was asked to do, answering the most difficult questions that were asked in my life. I was wriggling like an eel, trying to avoid the real answers, because I was afraid of what I could say. It’s amazing how much I led myself astray, rationalized my beliefs, decisions and choices to avoid the truth about myself. Tom motivated and supported me during the process of change. He was patient, but also tough if it was necessary. So if you read this wondering whether you should start working with Tom, because you’re in a place, where you’re stuck for too long and it’s becoming harder and harder, and feel that you need a change, because without it, you are lost, I encourage you to take up the challenge. For me, it was the most interesting journey, I’ve ever had”. Tom is without a doubt one of the most honest, intelligent and dedicated therapist that I have had the pleasure to work with. He helped me going through a serious transformation in a year when I was a real mess in many areas of my life. I had separated from my partner nearly 3 years earlier but my heart was still hurting. Tom helped me to get over him in an afternoon! I was also going through a time when I was drinking alcohol more than I wanted too and after one session I was able to stop drinking for 5 month and it was very easy to do. I felt that Tom very skilfully helped me to see important missing pieces in my puzzle of life! Tom has the ability to understand very profound information fast and he can help you go through very quickly and very important shifts. His knowledge and dedication comes through not only from his formal studies and techniques but also from his deep life experiences. He likes to work with people that are committed to change and to succeed in life and therefor he can help you go to higher and higher places if you want. This is our client “M.C.”. 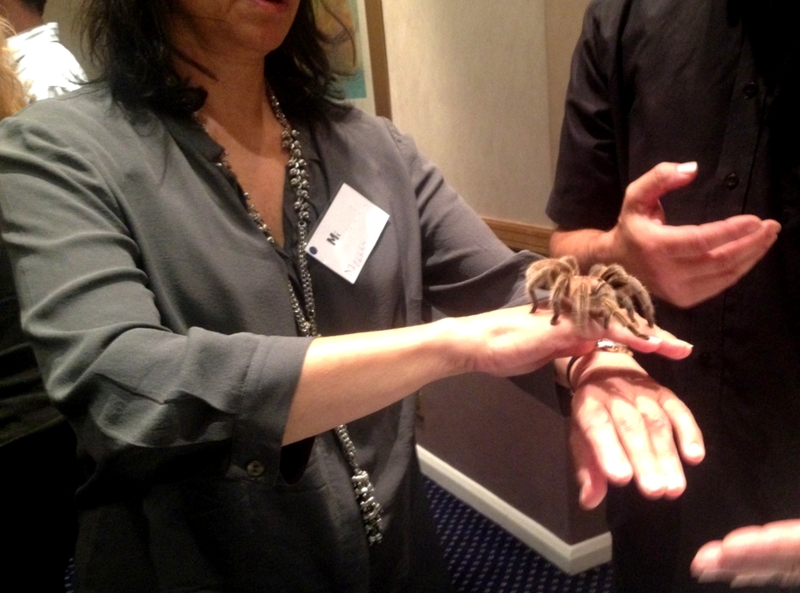 Before she started working with us she used to have a terrible arachnophobia for years.This is what she was doing after 40 minutes of working with us: Unfortunately we do not always have a spare tarantula to test our clients success – that time it was possible.